I've had a bit of a square foot garden experiment going on in the asparagus bed this year. Five years ago, when I decided I wanted to try growing fresh asparagus spears, I ordered just five little plug plants - it's all about tiny tastes here - and set them out in a five dice shape in a one metre square raised bed. Two of my five crowns have died off in the years since(1) so allocating a whole bed to one small perennial crop has made me think a lot about the waste of good growing space. If I consider the asparagus bed in terms of square foot planting, only three of the nine square foot spaces are being used. 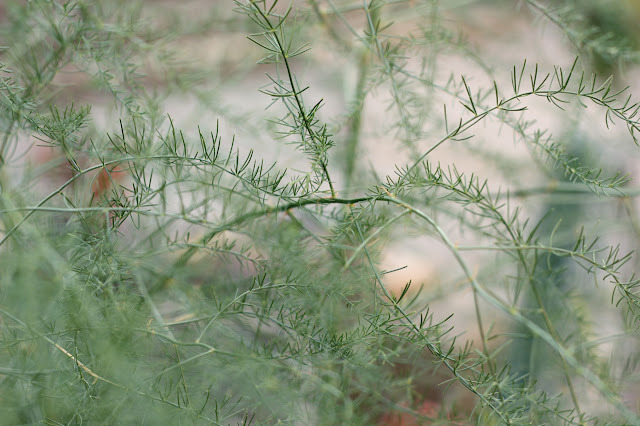 Traditionally, asparagus is grown in a designated bed on its own - no weeds, no other plants - so that the delicate roots (aka crowns) are undisturbed. So I was surprised to read(2) that basil and tomatoes are good companion plants for asparagus and decided to give it a try. The asparagus bed in mid June. Tomatoes planted at middle top and centre 3 squares. The self seeded Red Orach was later removed. 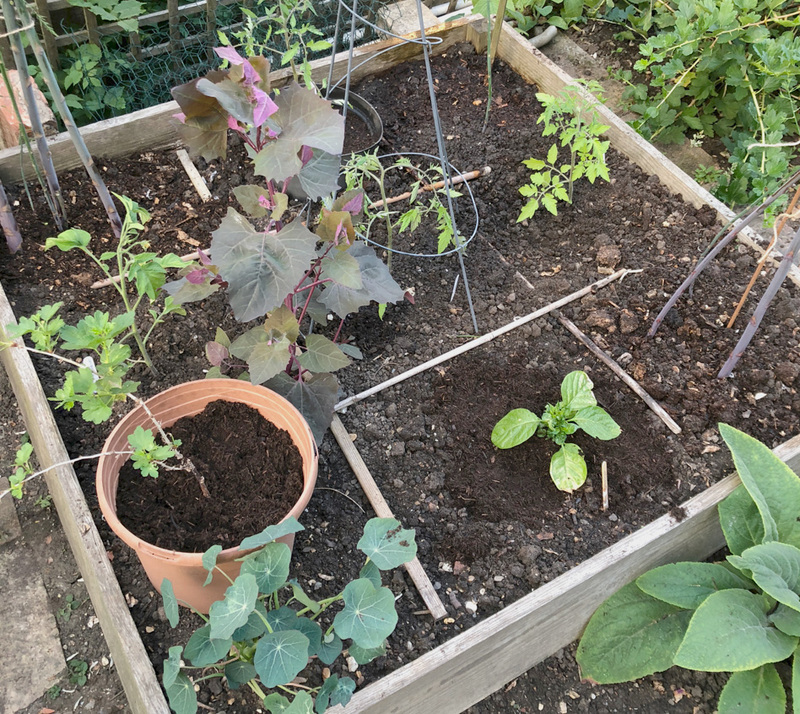 I marked the bed into nine squares and planted four tomato plants, a small Blue Pepe nasturtium and an Apricot chilli - all spare plants - into the gaps between the asparagus. Admittedly the chilli was a mistake; there hasn't been enough consistent sun for it to thrive as it's shaded by the redcurrant standard, but the tomatoes have done well and asparagus ferns seem to be unaffected by their new friends and have grown very lush. In fact they're far fernier than they've ever been! I had to dive in among the copious fernery and battle to restrain it in order to get at the tomatoes. Only time will tell if the companions have had a detrimental or beneficial effect on the asparagus but, if I get a good harvest of spears next spring, I think this will be the way forward(3). I will, of course, be topping up the bed with a good layer of muck and home compost once the ferns have died off and been cut back. 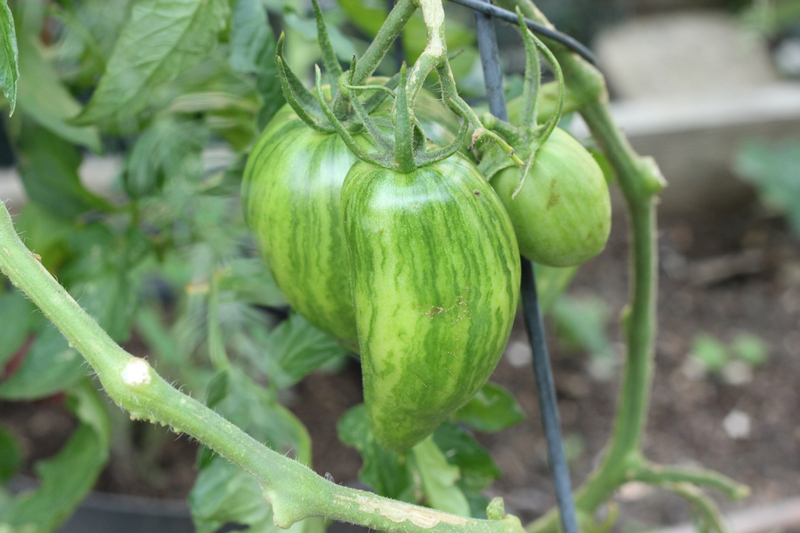 And, inspired by my recent visit to the polytunnels at Le Manoir Aux Quatr' Saisons, I have removed leaves from the tomato plants, leaving just a few at the top, so that the fruit can ripen. (1) "Two of my five crowns have died off ... " - I should have incorporated a lot more well rotted muck into the bed before planting as the soil was neither fine nor free draining - two fairly major requirements of asparagus. Hot dry sun and heavy rain over the years will have made the plants struggle. It's a wonder I have any spears! Also, I think it's taken until now to get a good plateful of spears once a week as it takes two to three years to get a decent harvest from one year old crowns. Mine were grown from baby plug plants, so allow four years to a harvest - 2018 was year five and pretty good. Asparagus crowns can be productive for over twenty years. (2) "I was surprised to read ... " - The book referred to is 'The Companion Garden' by Bob Flowerdew ©1991 - picked up from the free book shelf at Capel Manor and so interesting to read the 'science' behind companion planting from a well known and very experienced organic gardener. Hey, maybe I should write a series of blog posts on this; any thoughts? (3) "... the way forward." - An alternative to square foot companion planting would be to buy more asparagus to fill the gaps! "Five years ago" ?!!! That says it all when it comes to asparagus. I have twice bought 2 year old hands and planted them in autumn. First time, not one survived. Second time (last autumn) resulted in a 1 out of five survival rate for each of three varieties (each occupying a well manured short row). Next SPRING I will be filling in the gaps. In the meantime I have intercropped with turnip, kohlrabi and swede. THEY are all as happy as Larry and will be long gone come asparagus planting time. A year or two after that I might actually get a crop? We shall see. BTW I have also been doing a square foot gardening experiment in the school garden this year. My primary conclusion is to rule out cabbages, Brussels, broccoli and kale in future as they have bossed all their neighbours mercilessly. Eeek, winter planted! They really don't like to sit in wet soil. Hopefully you'll be much better off with spring planted asparagus but be careful of the roots. I think the plants need to build up strength to send up decent spears. In the first few years I got one or two spears (which is what made me think I was insane to grow them) but this year was much more productive. Square foot gardening is trial and error isn't it! What were the neighbouring plants to your brassicas? They're huge plants so I'm quite sure they can be very bossy! My book says that brassicas grow well with peas, potatoes, celery, onions and dwarf beans. Worth a try next year? I've been tempted to dig it all up on many occasions, Sue, but only because I'm short on space. If I had all your growing space I'd definitely put a bed in! The spears are so delicious - much sweeter and tastier than any I've bought (I grow Purple Pacific). Once the crowns are in, there's not much effort beyond weeding, mulching and keeping the soil moist - and apparently tomatoes deter the asparagus beetle (not that I've seen any of those yet!). I'm interested to hear how you go... My husband wants some asparagus - but in Buxton.... Am a bit dubious if I'm honest - all that cold, all that wet... what do you think? My growing conditions here in London are obviously much milder than yours in the Peak District but I don't have the easy access to water which you do. Asparagus like moist, free draining soil. their roots hate sitting in water though. If you have the space to create an asparagus bed then I'd give it a go. Homegrown and freshly picked asparagus is so delicious! Your asparagus crowns should be planted on a ridge in free draining soil that has had plenty of good well rotted manure or compost incorporated a few weeks before planting. 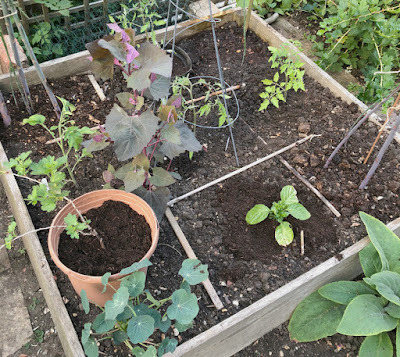 They prefer an average to slightly alkaline soil (pH 6.5) The site should be in good bright light (although asparagus will tolerate partial shade). In the winter, mulch the bed with more organic matter and cover with horticultural fleece protection when bad weather is forecast. The area around the crowns should be kept weed free - any weeds should be hoed off or gently removed so the asparagus roots aren't damaged. Hope this is useful, let me know how it goes if you go ahead with planting some crowns in the spring. In my square foot experiment, the other plants were away from the asparagus roots - tomato roots don't spread that far - but I've never been that precious about my asparagus bed. It was covered in a thick mulch of self-seeded shallow rooted foxgloves seedlings last spring. They pulled out very easily and the asparagus still grew well!